There are a variety of different methods to improving accuracy on the putting green: Using the two tee drill or single tee to try and reduce the size of the target, finding a practice green with a small hole, or even using one of the small thin disks to roll the ball towards. What seems to be a common trend with each, however, is they lack actual feedback on putts made due to their reduction in size. The Dead Zero Pro Putting Disk provides ample feedback on a small profile, and can be transferred easily between areas on the green for increased putting variety. How It Works – The Dead Zero Putting Disk is based on the proven concept that practicing with a target smaller than the actual target will help you build confidence and make it easier to hit the real target in game situations. There are plenty of examples of this across several sports and including golf already. Throwing footballs through a tire, shooting basketballs at a hoop with a reduced rim size, and hitting baseballs with a skinny bat are perfect examples. In golf, you already have reduced-sized club faces on irons and putters and reduced-diameter cups on putting greens. What you don’t have is a properly designed and sized putting target that can be used when and where you want.You can practice with the Dead Zero Putting Disk on any surface on any green at any time and get instant visual feedback while you practice. Keep it in your bag or keep it handy at home or in your office. Practice on any area of the green and challenge yourself with different slopes and speeds. Although designed for improving your confidence and making more putts of ten feet or less, the Dead Zero Putting Disk can also be used for long-range lag putting or green-side chipping. Why it Works – A golf hole is not as large as it appears. How many times have you hit putts that looked like they were going to catch the left or right side of the cup only to see the putt lip out? 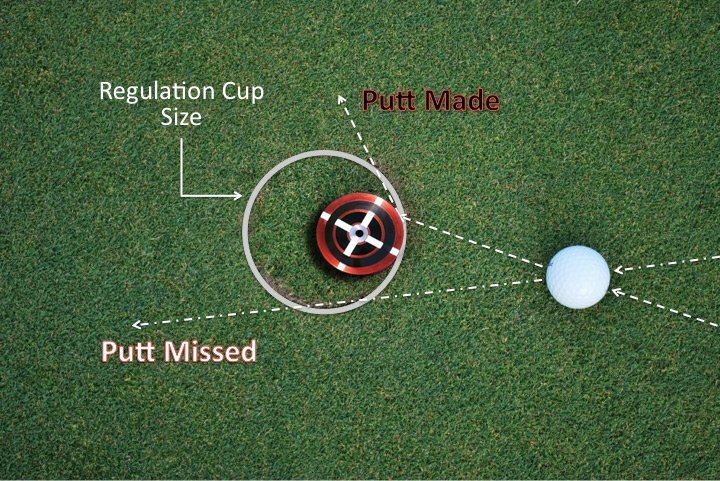 The reality is that the area of any golf hole where you are guaranteed to have the putt fall in versus lip out is much smaller than the full diameter of the hole. The Dead Zero Putting Disks are founded in scientific research and have been designed to be the optimal size for small target putting practice. 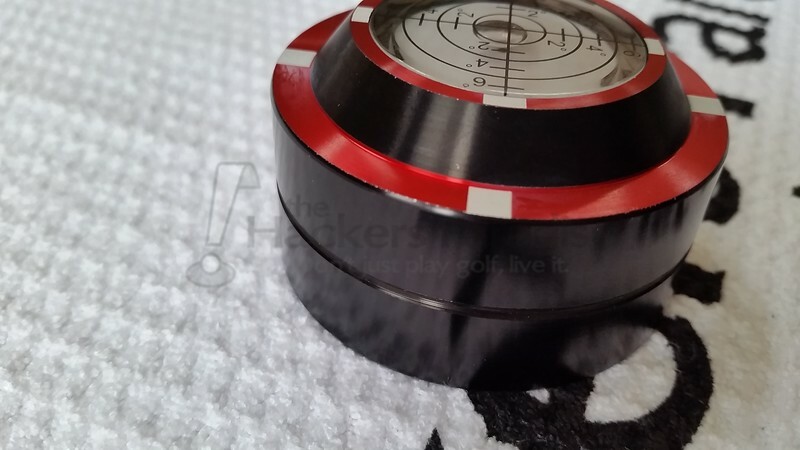 The disk size (diameter) is based on research combining ideal putt speeds (those that would travel 17” past the hole) with the measurement of an above-ground target. 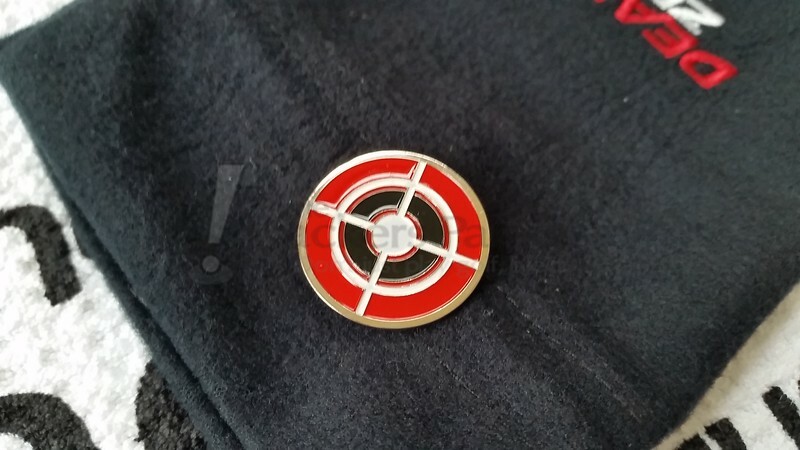 Referencing the graphic below, any putt that rolls within the target width (one that would strike the disk) would fall into the hole. Any putt that rolls to the left or right of a certain width, or misses the disk, results in a putt that misses the hole or lips out. 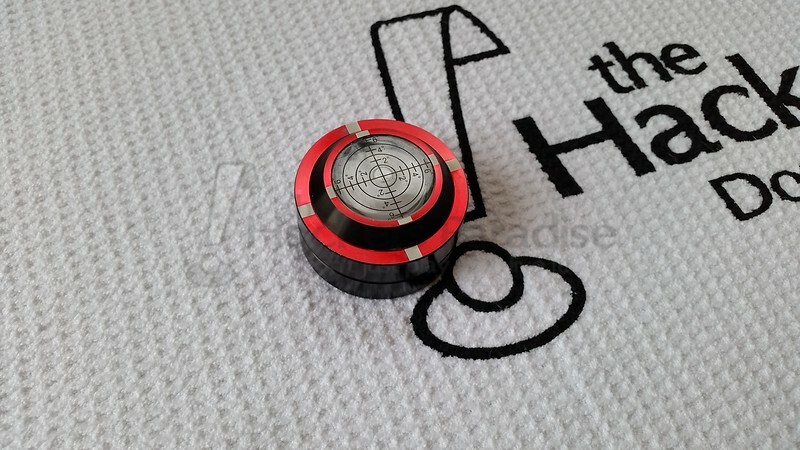 Golfers can practice with the Dead Zero Putting Disks on any surface from any direction. A putt with an ideal speed that either strikes the disk directly or just glances it slightly represents a putt that would have gone into the cup. That’s the beauty and simplicity of the Dead Zero Putting Disk. What is extremely nice about the Dead Zero Pro package is the inclusion of the soft pouch. Rather than worry about scratching or damaging other devices in the golf bag, the soft pouch separates the solid disk and reduces wear and tear from being in the bag at all times. Also included is a bullseye ball marker, which can be a useful tool when working on wedge game around the green for an aiming point. It is quite simple to get started with the Dead Zero Putting Disk. One simply finds a preferred section of the putting green and places down the disk facing upward. Then, it’s a matter of finding an ideal line to begin practicing, and the disk acts the same as a hole would. There are some major benefits to having the Dead Zero Putting disk on the putting green (and on any practice green, be it at the course or at home). To begin, the hole placements on that given day typically dictate where practice occurs, but with the Dead Zero Putting Disk golfers can select the best location on their putting green to begin practice. This testing occurred on a practice green that has some severe slope with only a couple of truly ideal locations for practicing. Being able to select a flatter portion of the green to practice was very beneficial. Reading slope will also be useful for people who struggle to find the subtle flow of greens, although being on a practice green would equate to immediate feedback on a ‘test’ putt. This could reduce the necessity for the pro version, however the addition of the bubble level adds confidence and visual representation of the potential slope at the target position. It will likely lead to a better understanding of slope versus break over time. The selection of black for the disk was smart. Not only is it extremely easy to see in the peripheral of putting setup, it reads much like a hole to the untrained eye. 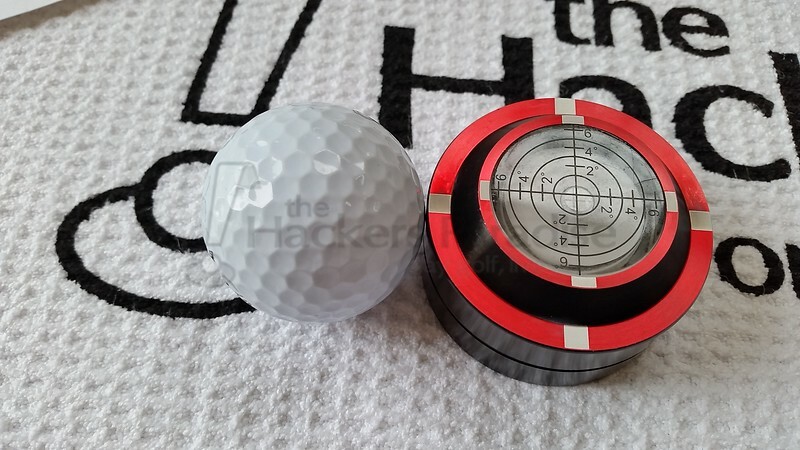 Testing included various other methods such as tees in the ground and various large ball markers, and the Dead Zero Putting Disk was by far the best visual performance when focusing on the putting stroke. As golfers are creatures of habit by nature (see: any pre-shot routine), focusing on a black disk and equating that to the dark edges of a standard golf hole was a major added benefit. One of the most valuable assets to the Dead Zero Putting Disk is the compact size without the reduction in feedback. Sure, placing a tee in the ground and putting to it reduces target size, however it does not indicate which balls would go into a regular hole despite barely missing. In the case of the Dead Zero Putting Disk, glancing blows represent made putts, which is both valuable in knowledge, and rewarding to the person practicing. 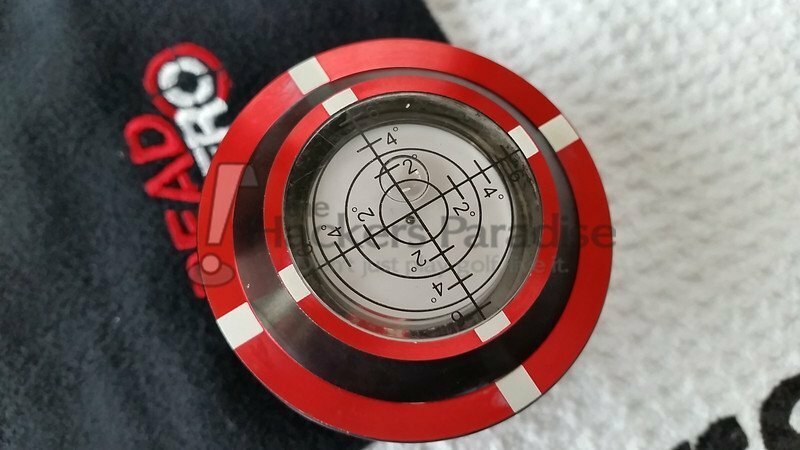 The quality weight of the Dead Zero Putting Disk provides users the ability to putt firmly towards the hole without worry of knocking the device over or off in another direction. While some movement occurs on extremely firm putts, it’s only a fraction different from the previous position, and not enough to warrant concern. In addition to the weighting, the rounded edge often sends accurate putts off to the side, leaving the device open for the next ball to make clean contact. One of the biggest concerns introduced by the idea of using a sizeable putting disk was the inability to ‘finish’ putts as the device knocks them off their original line. In reality, the Dead Zero Putting Disk is only wide enough to hit balls which are destined for the bottom of a regulation size cup, leaving little need to hit them a second time. It does not represent which balls would run by further than the 17 inches and lip the cup, but testing seemed quite clear which balls had too much pace heading towards the hole. There are a lot of options available to golfers for putting improvement, but the versatility of the dead Zero Pro Putting Disk far exceeded expectations and proved to be a very useful device. Whether golfers are seeking their own defined area of a putting green, or are simply trying to make the hole look larger on course, this unit will accommodate their needs extremely well. For more information on the Dead Zero Pro Putting Disk, visit www.DeadZeroPutting.com. Great review, and sounds like a very useful product. I think the pro version with the level on top would really help me see and understand break in putts a lot better. Appreciate the review and detail on this product Dan. This blends in well with the “max break / foot past the cup” mentality that I now have on the greens as I’ve learned about how the hole shrinks depending on where the ball is coming from. Appears to be a respectable value at less than $30. 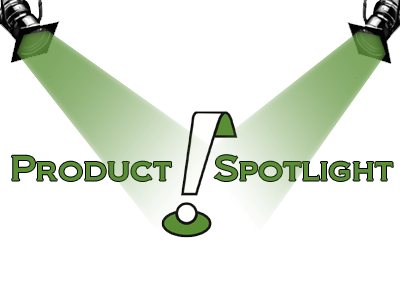 Great review on what seems to be a very useful product. I would be interested to see how the level holds up over time for the pro version. I find that at less than $30 is a reasonable price. Seems like a nice product and easy to tote and use. Nicely done, Dan.